The confines of this publication makes it impossible for me to fully explain the grip and its importance but hopefully the text and pictures below will help somewhat. Obviously the grip is the only contact with the club and the position of the hands greatly influences the ability of the wrists to hinge and support the club throughout the swing and to deliver the club with a square face at impact. Centrifugal force dictates the arching of the wrists at impact which if the grip is correct delivers the club square. 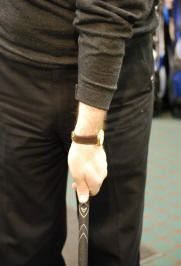 Generally our pupils tend to hold the club in their left hand too much through the palm which often leads to a weak grip. 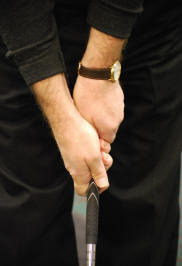 When closed up the Left hand covers the handle of the Club with the left thumb on top and slightly to the right side of the handle. Two to two and a half Knuckles should be seen and the V formed by the Forefinger and thumb should be pointing between the chin and right shoulder. When the right hand closes over the left thumb It should obscure it from view. The V of the right hand is parallel to that of the left hand. The little finger of the right hand overlaps the forefinger and Middle finger of the left hand. 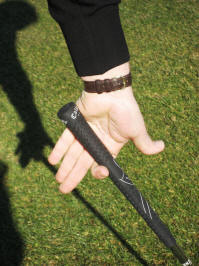 Note the club placed diagonally across the hand from the top of the forefinger to underneath the fleshy pad of the hand.